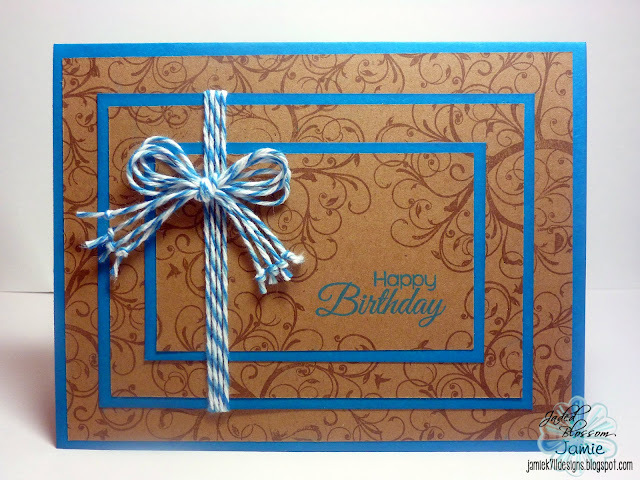 Jamie here to share a Triple Stamp Card and tutorial I made using Simple Sayings. First you will need 2 colors of cardstock, one to stamp on(kraft) and one for the base/contrasting(Teal). For the Base you will need to cut 3 pieces- 5.5"x8.5", 3.25"x4.5", and 2.25"x3.5" and for the one you stamp on you will need- 4"x5.25", 3"x"4.25" and 2"x3.25"
Next take some glue and put it on the center of the back 2 smaller pieces. I used a dot runner because you just want to hold the paper in place while stamping. You don't want it to be permanent. Then stack them on top of each other like in the picture above on the right. 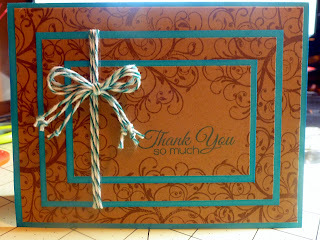 I stamped a sentiment from Simple Sayings on the smallest piece of kraft with an ink that matches the teal paper. Then I took the tree from the same set, inked it up with brown and stamped all over the 3 layers. Glue each rectangle onto the contrasting colored rectangle like in the picture on the right. I glue the smallest rectangle to the middle one and then add my twine to it. Then glue those to pieces on top of the base. And here is the finished card! There are so many different ways to stamp on these and you could also stamp the sentiment on a flag or tag and add it to the top. Plus they are really simple to make! You can buy the Simple Sayings set HERE! 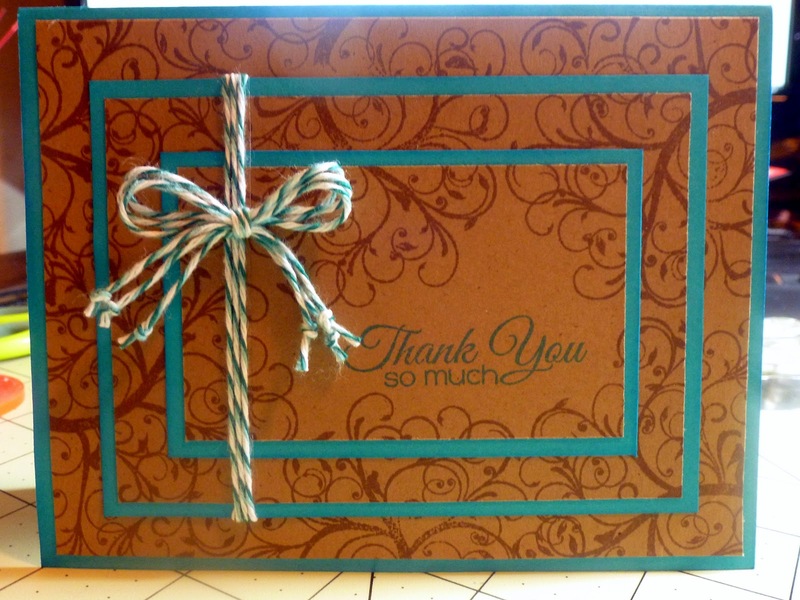 So very beautiful Jamie, what a wonderful effect with the swirl stamp! I have previously tried this triple stamping effect, but love your idea of the swirl and the addition of the twine - gonna try that tomorrow!! Gorgeous!! I love the two colours together!! I am going to have to retry this technique now that I have the measurements for each piece of card stock (before i was just guess)!! Beautiful Thanks for the Awesome Tutorial on this. Love it. This is so awesome great tutorial!!!! Fabulous! Super tutorial. I <3 all the pics. great tutorial!!! Love the pics and colors! A perfect card! Thank you for sharing the tutorial!